As I'm getting older, it looks like injuries are coming aplenty. Just as I was contemplating on undergoing physical therapy for my left shoulder, I hurt my lower back. Unfortunately I'm not exactly sure how I hurt it. The only activity I did recently was to cut grass in our backyard lawn. I do this by sitting on a low stool with a pair of garden grass shears. It's either that or my poor posture at the computer again. Thankfully, I already know a set of low back exercises called the Williams' Flexion Exercises that alleviates low back pain. So I performed these exercises twice a day for a week. I was pleasantly surprised that the pain was totally gone after a week. I'm still amazed how this chart of exercises have benefitted me and so I decided to write about these exercises as a mode for lower back pain treatment. How did I learn of these exercises? 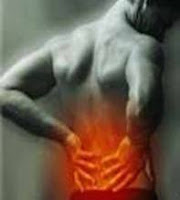 After I hurt my lower back due to heavy deadlifts in 2004, I was referred to a rehab doctor. Diagnosis was lumbosacral sprain involving L4 and L5. The physical therapists had me perform the Williams' Flexion exercies in progressive stages at the rehab center. In addition to the exercises, swimming was recommended and I fully recovered from the back sprain after several months. In 2010, I was back to weight training in my home gym. I was excited with my newly assembled home gym equipment and one of these was the parallel grip bar for the T-bar rows exercise. I miscalculated the weight to try in the T-bar rows and hurt my lower back. Again, I performed the Williams' Flexion exercises (from my old chart of illustrations) as patiently and diligently as I could. Amazingly, I fully recovered in less than a month. Dr. Paul Williams first published his exercise program in 1937 for patients with chronic low back pain in response to his clinical observation that the majority of patients who experienced low back pain had degenerative vertebrae secondary to degenerative disk disease (Williams 1937). These exercises were developed for men under 50 and women under 40 years of age who had exaggerated lumbar lordosis, whose x-ray films showed decreased disc space between lumbar spine segments (L1-S1), and whose symptoms were chronic but low grade. The goals of performing these exercises were to reduce pain and provide lower trunk stability by actively developing the "abdominal, gluteus maximus, and hamstring muscles as well as..." passively stretching the hip flexors and lower back (sacrospinalis) muscles. Williams said: "The exercises outlined will accomplish a proper balance between the flexor and the extensor groups of postural muscles..." (Williams 1965, Williams 1937, Blackburn 1981, Ponte et al.). Williams’ flexion exercises have been a cornerstone in the management of lower back pain for many years for treating a wide variety of back problems, regardless of diagnosis or chief complaint. In many cases they are used when the disorder’s cause or characteristics were not fully understood by the physician or physical therapist. Also, physical therapists often teach these exercises with their own modifications. Williams suggested that a posterior pelvic-tilt position was necessary to obtain best results (Williams 1937). Here are the illustrations of the Williams' Flexion exercises that help ease low back pain. This is not the complete list. I only chose the the lying exercises which have been very effective for my back rehabilitation. The illustrated lying exercises can be performed conveniently on the bed or floor. Choose a bed that has a firm mattress and does not sag. For exercises on the floor, use a mat for added comfort. A pillow under the head may be used in both cases. The chart of exercises may be performed twice a day: morning and evening. Prior to the exercises, use warm compress for the lower back. A hot water bottle with a towel between it and your lower back is sufficient. Never put on the hot water bottle on your back without checking its temperature. Rest the hot water bottle and towel on your lower back for 10 to 20 minutes. Avoid lying on the water bottle as this may damage it and cause leaks.